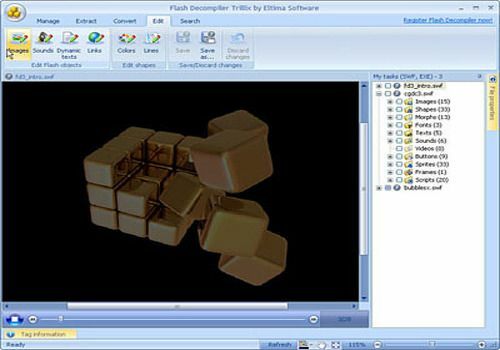 SWF Decompiler is a powerful SWF to FLA converter with the functionality to decompile Flash movies, convert SWF elements to multiple formats and edit SWF movies (dynamic texts, hyperlinks and others) without Flash Studio. With a one-click ease you can extract SWF elements: sounds, images, shapes, shapes, frames, morphs, fonts, texts, buttons, sprites and ActionScripts from any SWF file directly to your hard disk. With SWF Decompiler you can export Flash Video to AVI, MPEG, FLV and FLA, record sounds under WAV or MP3, images - under PNG, JPEG and BMP, texts under RTF, TXT and HTML. SWF Decompiler allows you to convert the entire SWF file to FLA, or export some Flash resources to FLA format. Flash Player EXE files are decompiled in the same way as common SWF files. SWF Decompiler will give you detailed information about the entire Flash movie, its shapes, images, morphs, etc., also tracking their location in frames and sprites and even recording original names and frames, ActionScripts and sprites. SWF Decompiler's unique SWF Editing Capabilities allows you to edit sounds, images, colors, gradients, lines, dynamic texts and links even without converting to FLA. An integrated browser makes it extremely easy to navigate your PC for Flash movies and add them even for decompilation and batch conversion. SWF Decompiler supports COMPLETELY Flash 5, 6, 7, 7, 8 and 9 including AS 2.0 and 3.0 without exceptions. Encode Your Flash SWF to AVI and MP4 Video Movies. Flash To Video Encoder converts any Macromedia Flash (SWF files) to video movie. The converting process allowing human interaction on Flash content during conversion. SWF Protector allows you to encrypt your flash film so you don't have to worry about someone stealing your precious artwork. It uses four different protection algorithms to play the SWF file in the Flash player by hiding the source code. Easy-to-use flash banner maker for creating Flash animated intro and banner with multiple scenes.